April 1, 2017 By Chelsea T.
Who doesn't love a good ghost story? Well, in Kentucky, there's a whole lot of them! From hospitals and asylums, to cemeteries, schools, theaters, restaurants, parks, bridges, and even roads, there's an endless amount of places throughout the state that are said to have some ghostly spirits lingering. Some of these creepy spots are located in the biggest of cities that everyone knows about, and others in small towns that only locals may know of. Take a peek below to check out our Top 10 Haunted Places in the state of Kentucky! Also known as the "castle on the Cumberland," this maximum security and supermax prison dates back to 1889 and has a capacity of 856 prisoners. It is located on Lake Barkley on the Cumberland River and is Kentucky's oldest prison facility and the only state-owned facility with supermax units. Paranormal Researcher, Steve A. Asher wrote a book titled "Hauntings of the Kentucky State Penitentiary," which features true, first-hands accounts of the paranormal as well as his own personal experiences at the state's most violent, and haunted prison. Some of the haunting reports include strange orbs, disembodied footsteps, voices and disembodied screams. Due to the violence at the prison, it's no surprise that many of the inmates that died there may have never left. Frankfort's Liberty Hall is located on Wilkinson Street and operates today as a learning center. 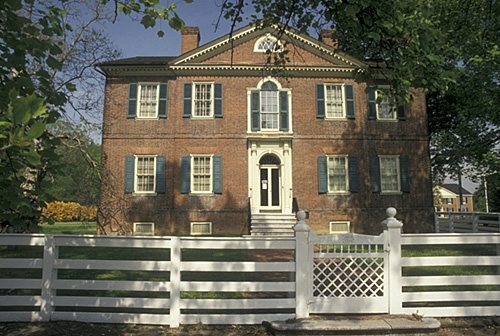 The historic home was built in 1796 by John Brown, an American statesman. It was added to the National Register of Historic Places in 1971 and is believed to have a resident ghost known as "The Gray Lady." On the hall's official website, they tell the story of the spirit, who has been traced by some all the back to the 1880s. Her spirit is known to wander around the home, opening and closing doors, and is always wearing gray. Also said to roam the property is the ghost of a Spanish opera performer who visited the home and mysteriously disappeared from it in 1805. A ghost in soldier's uniform resides here as well, and is reported to look into a ground-level windows with a love-struck expression on his face. 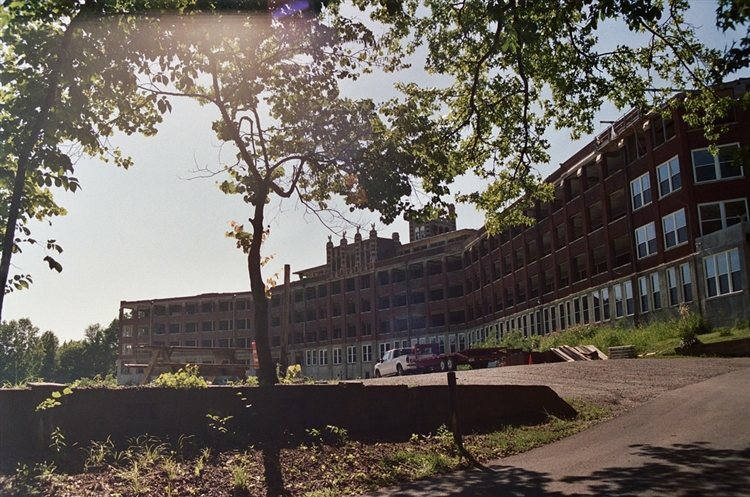 The Waverly Hills Sanatorium in Louisville is known as one of the most haunted places in the country, and is a historical landmark as well. The sanatorium first opened in 1910 as a two-story hospital to accommodate no more than 50 tuberculosis patients. It closed in 1961, due to the antibiotic drug streptomycin which lowered the need for such a hospital like this one. In July of 1983, it was listed on the National Register of Historic Places and is said to be quite haunted. The establishment has been featured on TV's Ghost Hunters as being one of the most haunted hospitals in the eastern United States and was also on ABC/FOX Family Channel's Scariest Places on Earth, VH1's Celebrity Paranormal Project, Syfy's Ghost Hunters, Zone Reality's Creepy, the British show Most Haunted, Paranormal Challenge and Ghost Adventures on Travel Channel. 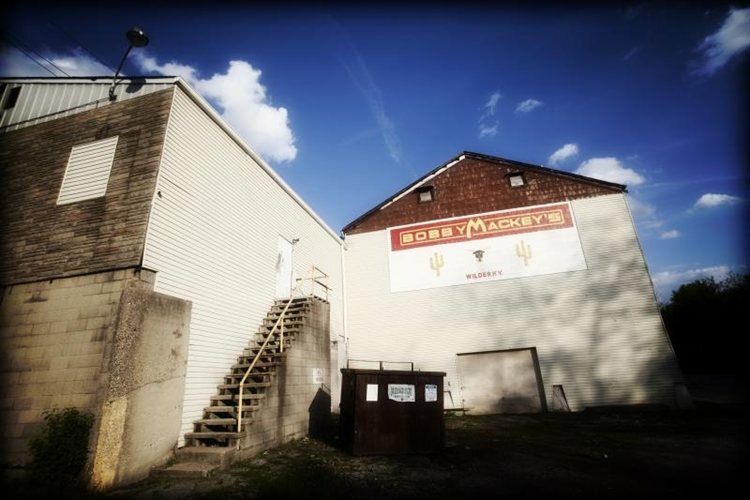 Located in Wilder, Bobby Mackey's Music World is a nightclub owned by country singer Bobby Mackey. The establishment is a well known haunted spot in Kentucky and according to the club's official website, the place even offers Haunted Tours and Private Investigations. Stories say the building once operated as a slaughterhouse and Alonzo Walling and Scott Jackson, two alleged Satan worshippers, were said to have killed Pearl Bryan in 1897, leaving her head to be found near the building. Before the two were hanged for the crime, they promised to haunt the place after their deaths, and local legend says they kept their promise! Both men are said to haunt the well room, and many say the well is an actual door to Hell. Another ghost who lingers here is that of Joanna, a dance hall girl who committed suicide. 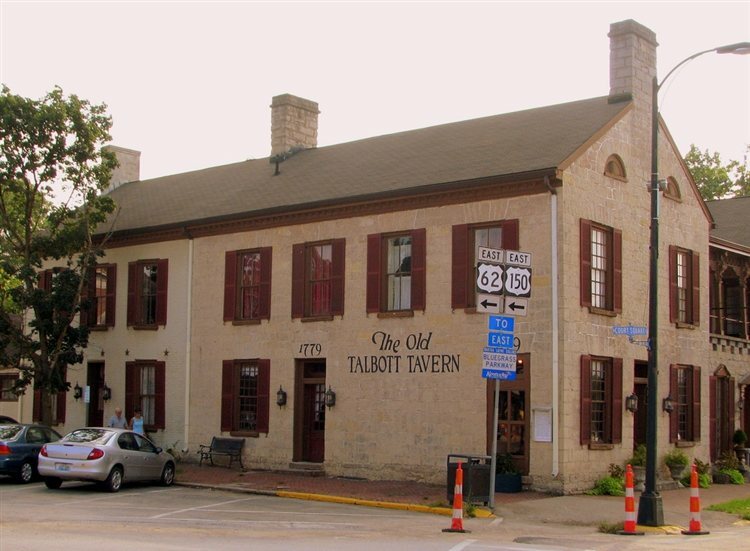 Bardstown's Old Talbott Tavern dates all the way back to the 1700s, making it no surprise that it is rumored to be pretty haunted. The establishment features a restaurant, bed and breakfast and bar, and apparently some ghostly residents as well. The tavern's official website has a page dedicated to the "Ghost Encounters" that take place there and tells the stories of some haunting reports. According to the page, the most popular ghost is supposedly that of Jesse James, and another is the Lady in White. The two appear as apparitions and other stories include orbs moving around the room in the middle of the night or flashes of light without cameras. Other haunting reports include objects that move on their own, such as forks or glasses on dining room tables, keys that disappear from the front desk and show up down the hall on the floor later in the day, furniture that jumps up and down without reason, and shadow figures. The Cave Hill Cemetery in Louisville sits on 296 acres, its main entrance on Baxter Avenue, and a secondary one on Grinstead Drive. 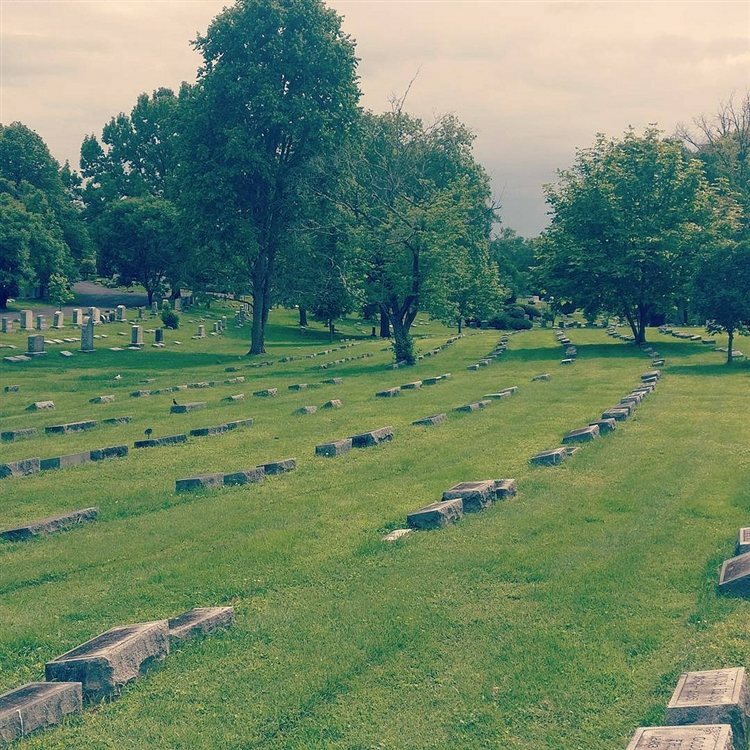 The cemetery was added to the National Register of Historic Places in 1979 and is the largest cemetery by area and number of burials in all of Louisville. It holds both Union and Confederate soldiers on its property and has been haunted by strange lights, cold winds and the sounds of whispers during the night. 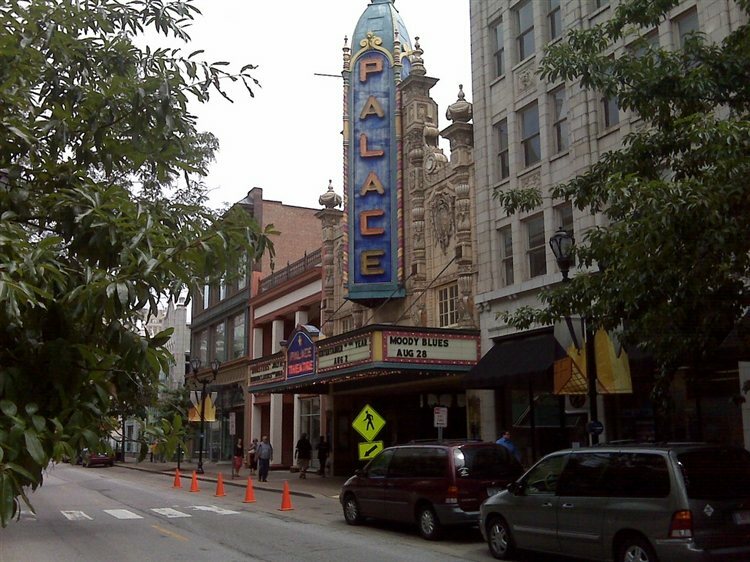 Louisville's Palace Theater is located in the city's theater district on the east side of Fourth Street, between Broadway and Chestnut Street. The theater first opened in 1928 as the Loew's Theater and features two stories with a floor and balcony. The elegant and ornate establishment isn't only known for its entertainment, it's also said to have some paranormal activity as well. A faceless woman in 1940s-style clothing has been seen climbing the stairs in the mezzanine lobby, a man in 1930s clothing likes to hangout in the balcony area and is said to disappear after being approached, the sound of a child giggling has been heard in the bathroom, the ghost of a projectionist is said to haunt the projection booth after having a heart attack on the job, and Ferdinand Frisch, an employee who died in the building in 1965 is also said to appear throughout the building. 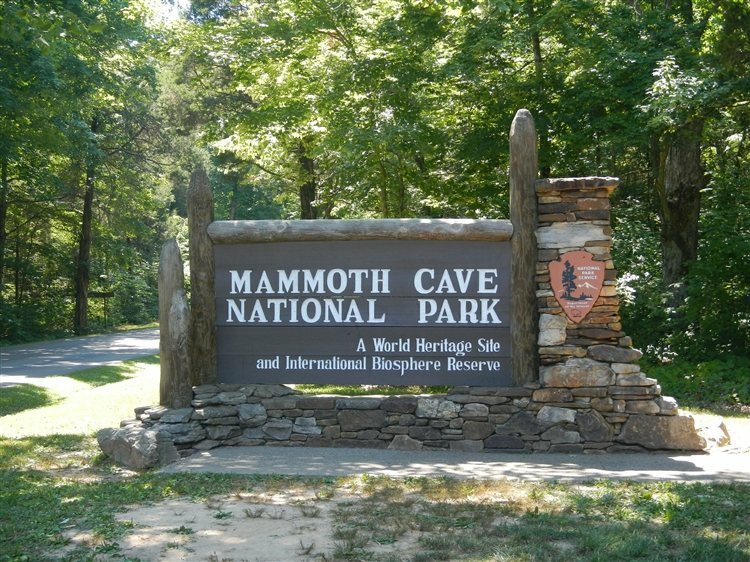 Mammoth Cave National Park is home to the Mammoth Cave, a long cave system of chambers and subterranean passageways. The park was established as a national park in 1941 and covers over 52,000 acres of land. The name of the ghost that is said to linger here is that of Floyd Collins, a man who owned a section called "Crystal Cave" but was losing out in what now become known as the Kentucky Cave Wars. He was losing money and his cave was hard to get to and lacked lodging, and according to Cult of Weird, Collins started to excavate an entrance to Sand Cave, in hopes he could steal some visitors from the then-privately owned Mammoth Cave. While Collins was excavating, his leg was pinned by an enormous boulder and he was found a day later. Many arrived in order to help, but another cave-in occurred and now Collins couldn't be saved by amputation. After two weeks, he died from exposure. Many believe his spirit still lingers, and his voice has been heard calling out for help, and objects have been thrown. The historic district of Old Louisville is the third largest such district in the country, and the largest preservation district featuring almost entirely Victorian architecture. 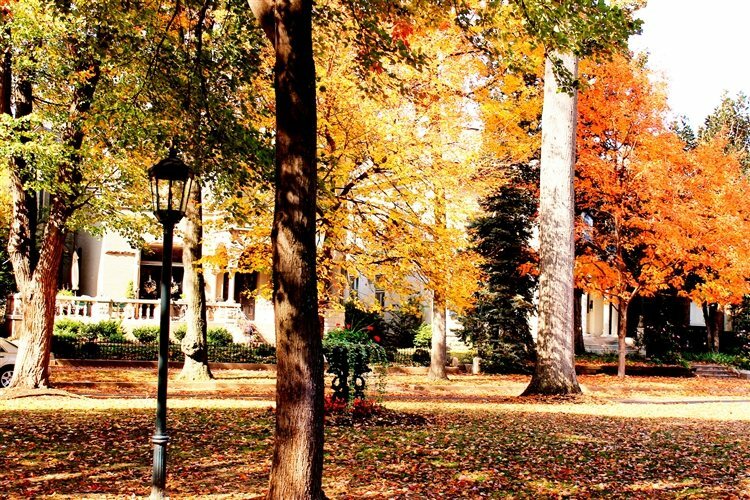 It stretches across 10 acres of land, about 48 city blocks and was established in the 1850s. The district is located north of the University of Louisville's main campus and south of Broadway and Downtown Louisville, in the central portion of the modern city. There are a number of ghost stories surrounding Old Louisville, and some have called it the most haunted neighborhood in America. 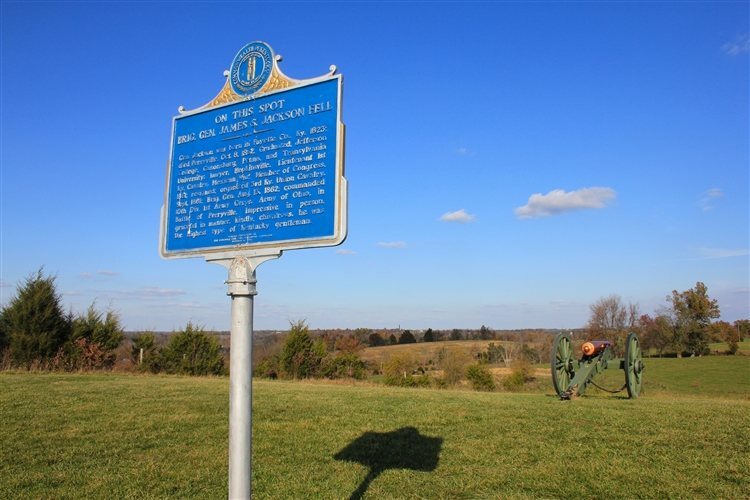 This State Historic Site is a 745-acre park that features a museum located near the site where many Confederate soldiers were killed in the Battle of Perryville were buried. Established in 1862, the battlefield was added to the National Register of Historic Places in 1966. Over 7,000 people were killed or wounded during the battle, which was considered the largest Civil War battle in Kentucky. Corpses were left to rot on the battlefield and many believe those who died are still lingering in spirit there today. Haunting reports include apparitions of soldiers, some riding on horseback, and glowing balls of light that have been seen throughout the field. Click here to read about more Haunted Places in Kentucky!